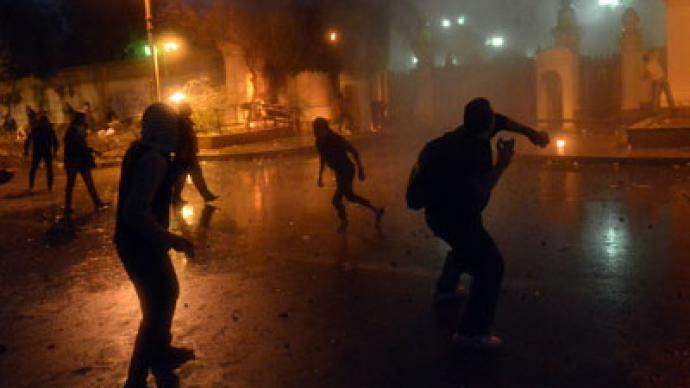 Sporadic clashes continue near Cairo’s presidential palace with police dispersing petrol bomb-throwing protesters with teargas and birdshot. At least one person has been killed in the violence, with dozens injured and arrested across the country. 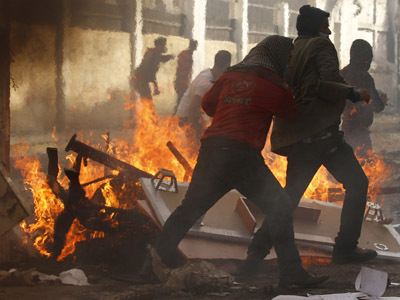 ­At least one protester was killed and over 50 injured during clashes in Cairo on Friday. “He was shot with two bullets, and that's the report of the hospital. The shots were in the neck and the right side of the head,” one of the witnesses told Reuters. The 23-year-old identified as Mohamed Hussein Qurany was killed by ‘live’ metal bullets medical and security sources confirm. Dozens of people have reportedly been arrested. Some of the arrests turned ugly with at least one case of police beating and stripping a protester, and dragging him naked into a police van “like a piece of meat,” Cairo-based journalist Bel Trew reported in her twitter. Before they caught the protester the Cairo Security Forces were laughing and shouting “go get him, go get him,” Trew added. 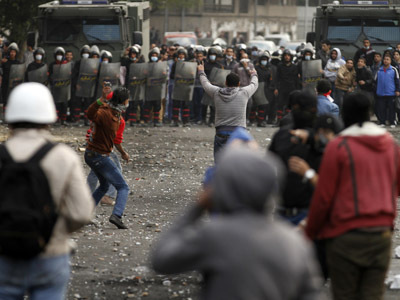 ­Renewed clashes were also reported in Alexandria and Port Said, two of the most volatile cities in Egypt. In Port Said a group of some 30 protesters reportedly started a sit-in in the police headquarters, demanding local authorities to resign. Protesters threw Molotov cocktails and launced fireworks over the gates of the presidential building, Bel Trew told RT earlier. The angry crowds were pushed back by the teargas-firing security forces on armored vehicles, she added. Deafening shotgun fire was heard on the scene of the clash, as the police started to fire directly at the people, Trew reported. Nasty battle going on now. 4 #csf trucks shoot gas at crowds. Csf officer shoot birdshot at fleeing crowds. "People are still chanting in amongst this chaos that the president must step down, and this is the sentiment accross the capital," Trew reported. 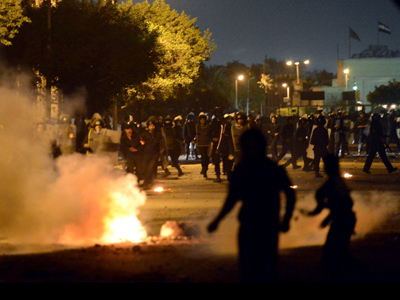 Petrol bombs and stones were also reportedly thrown at the British Embassy in Cairo, according to Al-Arabiya. Egypt’s presidential office has called political factions to withdraw from outside the president’s palace, Al-Arabiya said. 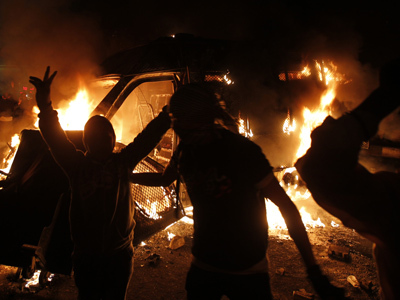 Egyptian PM Hesham Qandil has also urged all political parties to condemn violent protesters. But the opposition is unlikely to call the people off the streets after it spoke in favor of mass demonstrations despite Thursday talks with Sheikh Ahmed Al-Tayyeb of Al-Azhar University. Al-Tayyeb, a well-respected spiritual figure in Egypt, urged the rival sides to renounce violence and agree to set up a committee to start peaceful talks. “The marches for tomorrow are still on, as the Azhar document condemns violence but we are not doing anything violent,” one of the opposition members was cited by Reuters. Chaos and violence will continue if Morsi ignores the peoples’ demands, the opposition leader Mohamed ElBaradei said on Friday according to Al-Arabiya. Egypt’s National Salvation Front will meet Saturday to discuss the latest developments, Al-Arabiya added. Sporadic clashes with the police in Cairo were also reported earlier Friday, and several protesters were injured by rubber bullets. Several thousand people have gathered in Tahrir square on Friday, Bel Trew told RT. “We came here to get rid of Morsi. He's only a president for the Brotherhood,” a protester told Reuters from amid the angry crowd that filled Tahrir square. “I am here because I want my rights, the ones the revolution called for and which were never achieved,” another protester said. Protesters dressed in black marched through the streets of Port Said, Alexandria and Ismailia chanting anti-Morsi slogans and proclaiming their anger over the nearly 60 victims of the recent civil unrest. The Suez Canal city of Port Said saw crowds of protesters shouting, shaking their fists and carrying portraits of those shot in fierce clashes with police last weekend. For the people protesting in Port Said, Friday also meant a year since the football stadium riot that left 74 people dead and hundreds injured. In Alexandria hundreds of marching protesters blocked a major traffic intersection, Reuters said. The last spike of violence in Egypt marked the second anniversary of the January 25 revolution. 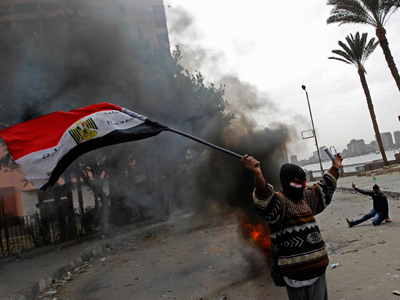 Last week’s deadly clashes proved the protesters demanding Morsi's government overthrow are not giving in. The Egyptian opposition has also persisted in its demands to form a unity government and have the controversial constitution amended.